If you’re preparing for the Architecture Registration Exam 4.0 Schematic Design (ARE SD) this is your one stop shop. While studying for the exams, a huge hassle was finding all the right resources. (Believe it or not, there’s a lot of crappy info out there). This is a place you can come to find a list of resources for the exam. If you have any additional resources, leave a comment below and I’ll add it to the list. For the other parts of the ARE on this site there are quizzes to help you study. But since this exam is solely vignettes you won’t find that here. Below you’re simply going to find the resources (albeit the best resources on the web for the exam). Kaplan: Schematic Design Study Guide – I don’t really see a point in buying this unless you need an extra book for your shelf. It’s a daunting read that doesn’t really help prepare you for the exam. I suggest just diving into the practice vignettes. Ballast: ARE Review Manual – This is a giant 800 page book with all of the sections of the exam. It’s pricey, but it takes a very indepth and comprehensive look into each of the sections. It’s VERY thorough but is sometimes hard to get through. The schematic design section is in Section 4. Unlike the Kaplan guide, the Ballast section on SD are succinct and doesn’t try to give you extra (and unnecessary) fluff. The Architect’s Studio Companion: Technical Guidelines for Preliminary Design – A helpful reference for architects. It contains a lot of charts to accurately design elements. The only downside I’ve seen anyone mention is that it lacks quick and easy rules of thumb to help when designing. Time-Saver Standards for Architectural Design Data – I’ve seen a lot of praise about this book and it’s been called an “invaluable reference” by reviewers. It’s not for structural design but it should give any (aspiring) architect a firm understanding of what they need to know. NCARB: SD Exam Guide – Directly from the source. A brief overview of the test and what to expect the vignettes. SBYRKTCT’s Help – There are a bunch of resources here. I love the vignette tips here. Black Specs SD Video Course – These videos are helpful at getting a general feel for the test but I wouldn’t solely rely on them to pass the exam. At ±$100/mo I’m not sure it’s worth the money, but it’s an option. ARE Exam Prep: SD – I didn’t purchase this material for the SD exam but I did for other exams. If you’re feeling unsure about the exam, hate reading, or just can’t devote a lot of time to reading, it’s a good resource. The video guides should be pretty helpful. 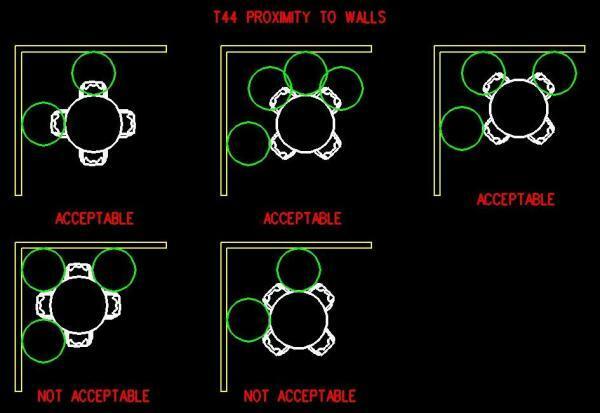 Interior Layout diagram: Proximity to walls – Mirror 1 – Mirror 2 -Shows acceptable and unacceptable layouts of objects near walls. Brandon’s Pass Notes – Mirror 1 – A great guide that gives graphic notes and tips and tricks on the interior design layout. Post your practice vignettes to AREcoach, & NCARB’s Google Plus page. Have any additional resources for the ARE SD? Leave them in the comments below!